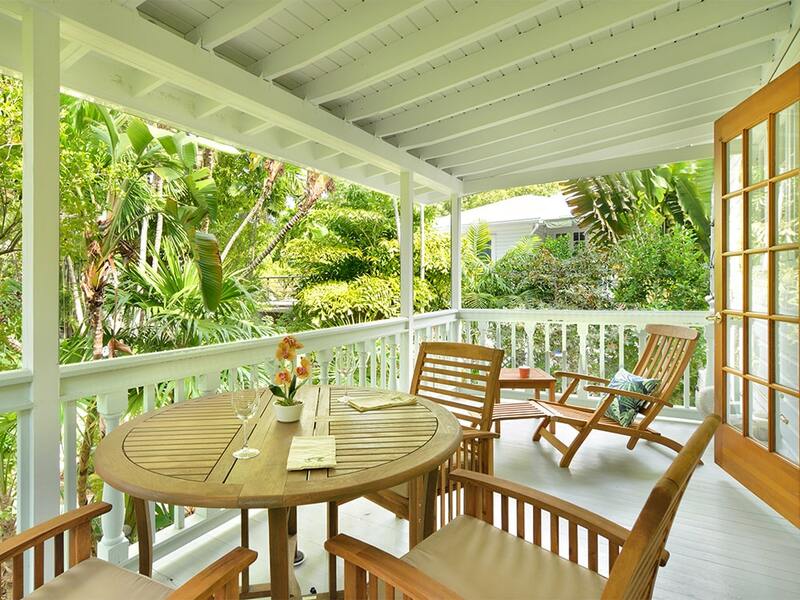 Strikingly set in the oft-missed Key West mid-town neighborhood, we find Island Elegance, making a classical curbside statement with its craftsman-colonial architecture, lush mature tropical landscaping, and white picket fencing. 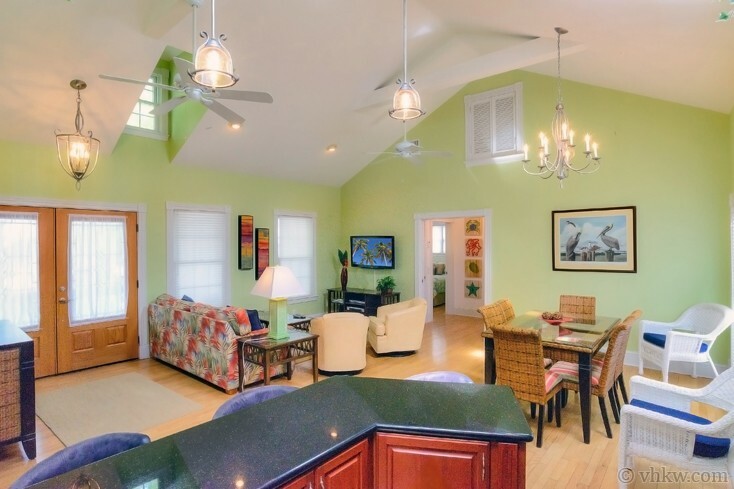 Built in 2005, the design of this home incorporates the timeless historic features of a grand covered front porch with capital posts, and a triple-set of dormer windows. 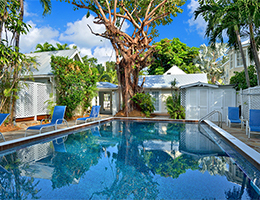 Situated on a corner lot, in a quiet neighborhood with an eclectic assortment of island architecture, ranging from Caribbean cabanas to vernacular Victorians, Key West island charm is all around. The setting of this elegant home is perfect for persons who are searching for their own island hideaway for a month or more. Fully fenced on a corner lot, it is well away from the hubbub, yet near two prominent beaches, and still close enough to Old Town that you can easily get around by walking and bicycling. 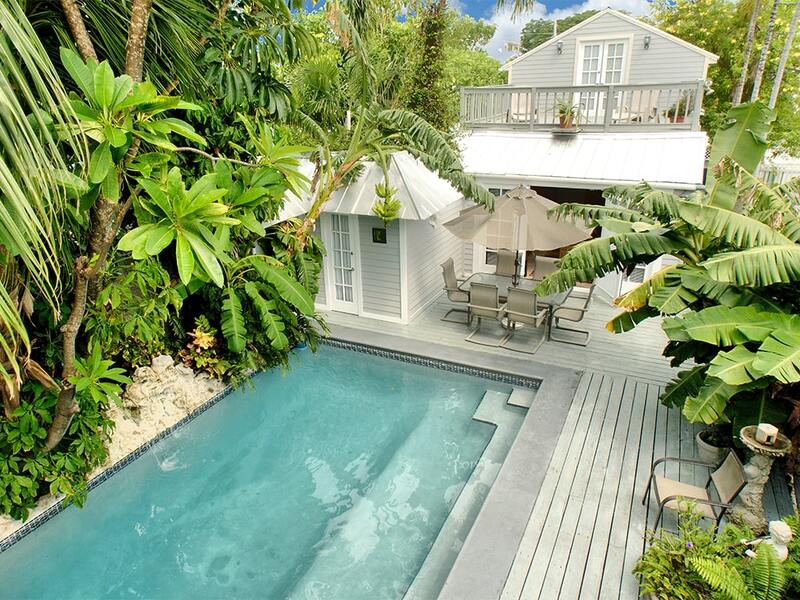 Tropical island elegance is pervasive inside as well as outside this property. Walk through the charming garden gate to the spacious front porch and you’re welcomed through a double set of varnished wooden French doors with leaded glass windows. Step inside the house and you’re in the spacious great-room made to feel even grander with steep sloping open-beamed ceilings. The first dormer window, at the front peak of the roof, along with skylights at the kitchen side of the house. Light bounces around in all the right places with multiple windows. When the sun goes down, recessed ceiling lights and fashionably hung pendants assure plenty of glow. 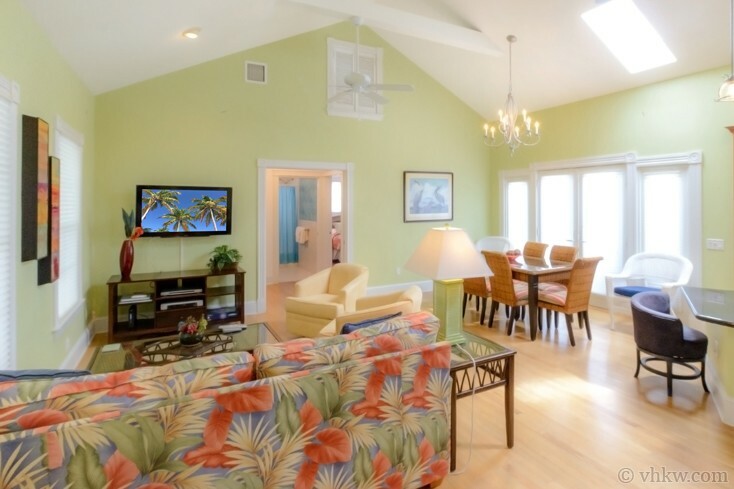 Decorator white ceilings are in perfect contrast to Key West lime green walls. 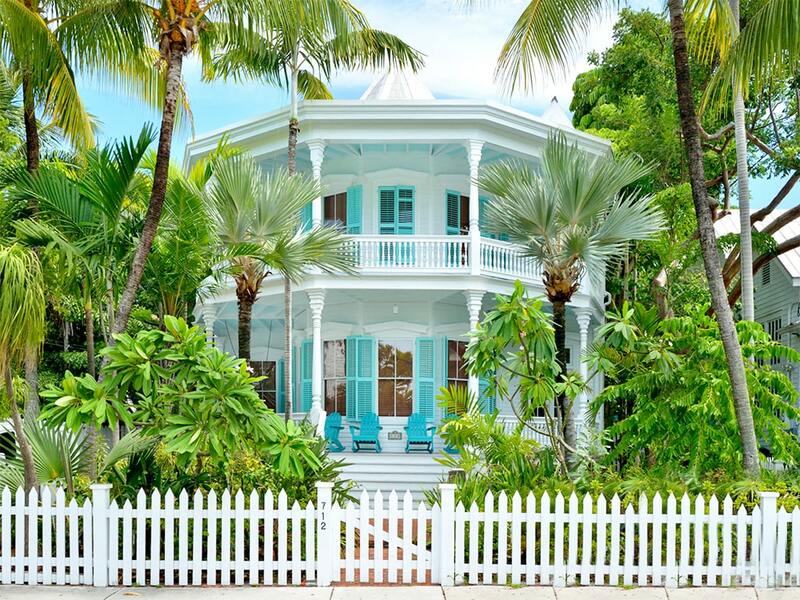 Comfortable contemporary tropical furnishings are mixed with traditional classic design, fabrics echoing the bright flora the island landscape. A large flat-screen TV is prominently placed for indoor downtime. Directly opposite the front doors, we see another set of double French doors that lead to the back deck. But before we go there, let’s take notice of the ample interior space, with an elegant glass topped dining table lit with a contemporary chandelier. 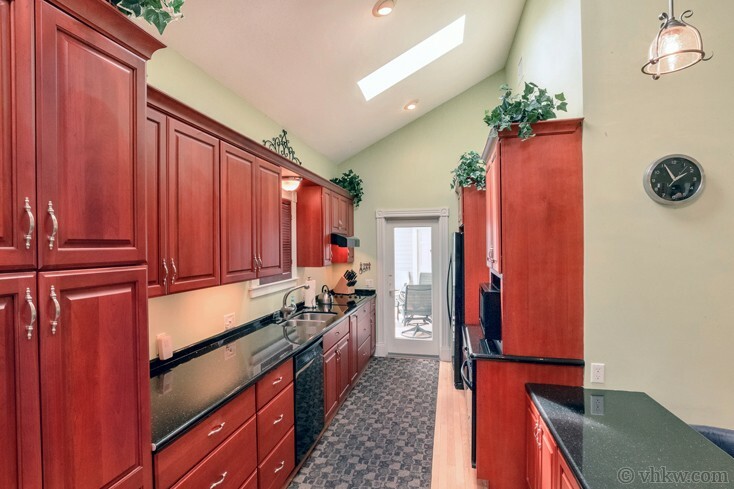 Immediately to the right is the handsome spacious U-shaped kitchen. Dark mahogany cabinets run the length of the two kitchen walls, opposite each other, in beautiful contrast to the black appliances and granite counter tops. On the living room side, the countertop extends to a counter height L-shape, forming a perfect place for coffee and a nice place to place a lap top. At the back U-end of the kitchen, a single glass pane door leads to the covered back porch set with an outdoor dining table and chairs. 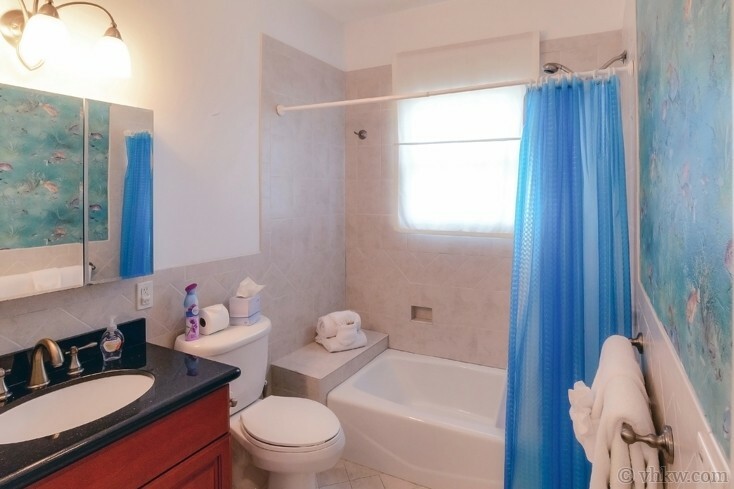 Then, discretely placed just past the covered dining area, we find a beautifully designed combination laundry room with bathroom, complete with a full size tiled shower, commode, laundry sink, and a folding table. 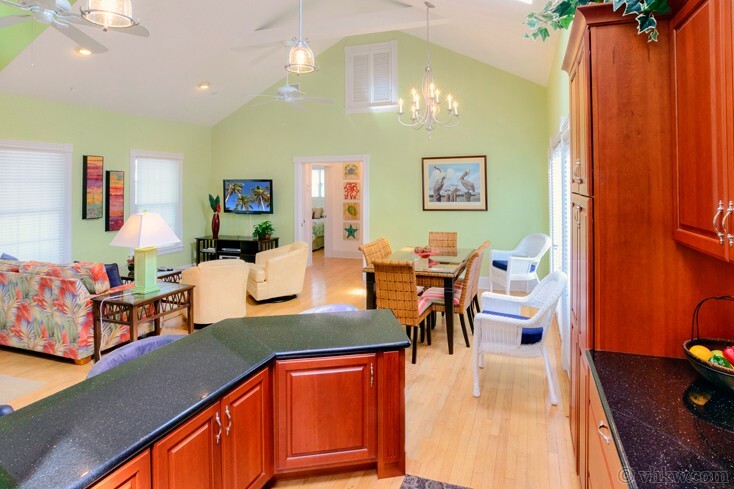 Since you’re not very far from the beach in this house, this room becomes the perfect place to rinse off the sand, and drop off your suit, snorkel gear, and beach towels. Before we go outside and look around, let’s go back in the house and address the bedrooms and bathrooms. 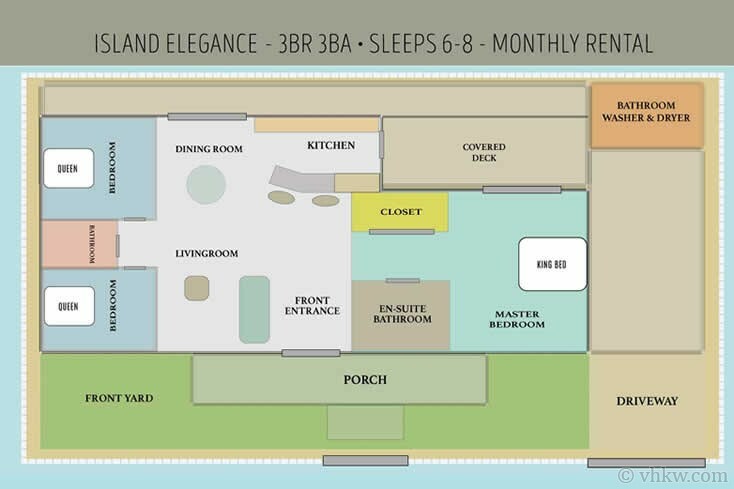 Island Elegance offers a desirable split-bedroom floor plan, with the master bedroom and en-suite bathroom on one end of the home, and the other two bedrooms and shared bathroom on the other. All bedrooms are island aesthetic, each with a unique décor, while the bathrooms are made upscale with black granite counter tops and travertine style tile; each room displaying a custom and creative feel. Tropical color, texture, and light play an important part in the décor of the bedrooms, and the effect is relaxing and stimulating. Facing the front of the house, we look to the right, and begin our tour with the spacious master bedroom with en-suite luxury bath. A high peak ceiling and two dormer windows are carried into the master suite – one in the bedroom and one in the bathroom, creating a grand open-feeling to both spaces. In the bedroom, sunshine yellow walls are in natural contrast with the crisp white trim and dark mahogany wood furniture. Another treasured feature, is the double sets of French doors leading to the back covered porch, giving direct access to the outdoors from the master suite. For sleeping, the master bedroom offers a king size with curved metal headboard. Contrasting furniture is carried to the matching dark mahogany dresser with mirror, side tables with reading lamps, and an easy chair for relaxing and reading. The tiled en-suite bathroom designed for two, provides a double sink vanity, elegant bath fixtures, and an awesome oversize shower with frameless French glass doors. 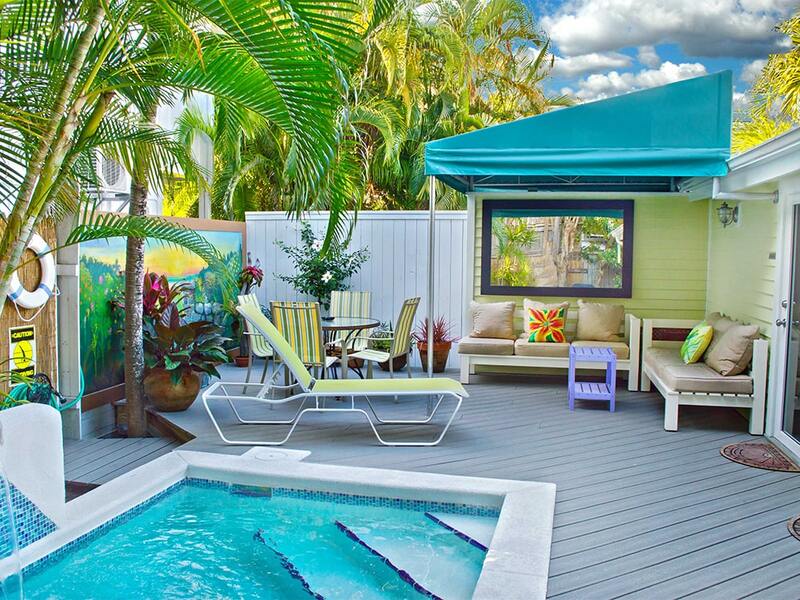 A swath of tropical wallpaper adds a nice touch to the scene. As we move away from the master suite, we walk back through the great-room to the opposite side of the house. Here we find the other two bedrooms, with shared bathroom in between them. Each bedroom provides a queen size bed, each with a unique island theme décor. The back bedroom, painted off-white, is furnished with honey colored wicker and wood furnishings. With the bed made up in red, gold, and green tropical colors, the room takes on an exotic island feeling. In contrast, the front bedroom features white wicker furniture, and uses a tropical pastel palette of green, blue and yellow. Hand faux painted leaf-green wainscoting topped with two adorable blue sea-horse wall plaques creates a playful island style. 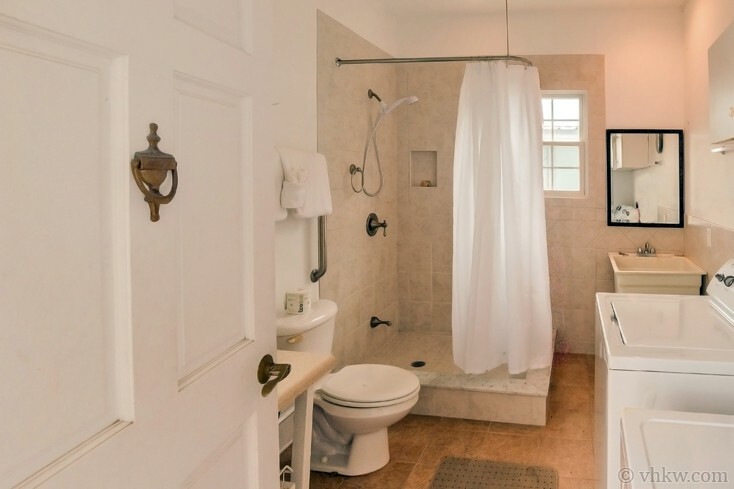 Just out the bedroom doors, a few steps away from each, is the shared full bathroom. As functional as it is pretty, it is tiled throughout, and providing a single dark wood vanity sink with pretty fixtures. If you like to soak, this bathroom provides a bathtub along with an in-tub shower. 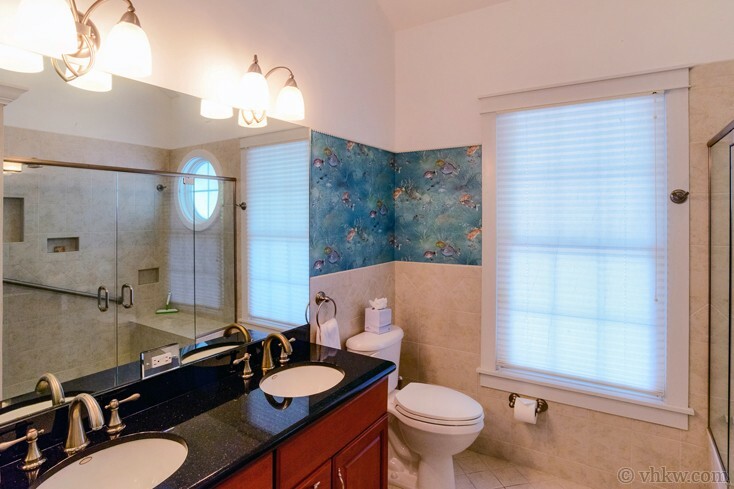 One wall features the same creative underwater tropical theme wallpaper found in the master bathroom, just to remind you that after all, you are in Key West. Stepping back into the great-room behind the dining table, we find the French doors, with side lights, leading to the back deck. Step outside and turn right, and the deck leads to the covered back dining porch, with table and chairs, and then from there on to the outdoor bathroom / laundry-room. The deck, albeit relatively narrow, runs the entire length of the back of the house. When you turn left out the French doors near the dining table, the deck leads to the more spacious side yard. Before we finish our tour, let’s walk back around to the front of the property. The front garden of the home is a beautiful outdoor feature, that you’ll surely enjoy from the classical covered front porch, where two rocking chairs are placed to encourage whiling away and taking in the outdoor scene. With many places to place a hammock, you may even find yourself making a new daily island ritual of swinging, reading, and sipping wine. Another nice feature of this property is that there is plenty of parking. Take your choice of the brick paved private driveway, or pull up in front along the street. While we don’t encourage bringing several cars to the island, there is certainly plenty of room to park if you need it, and there is no need for a parking pass. 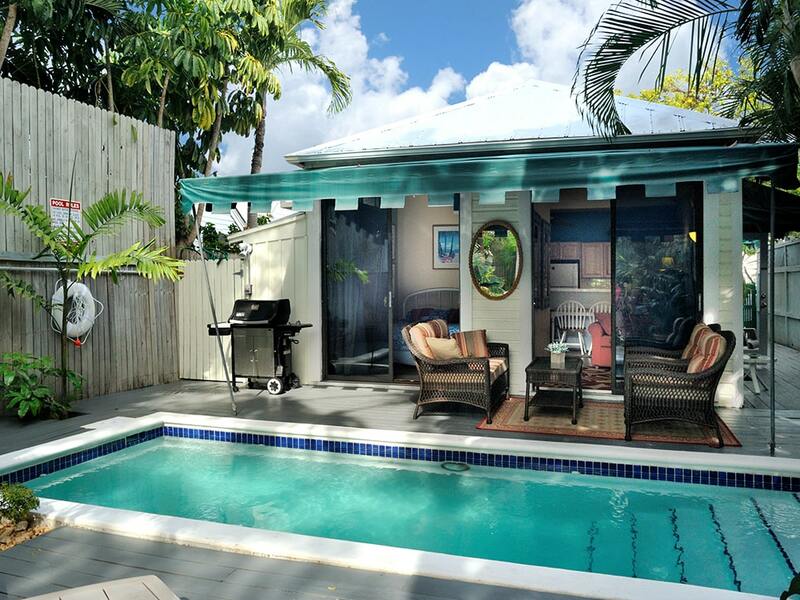 Amenities: Tropical gardens and landscaping, fully equipped designer kitchen, outdoor dining deck, BBQ. Central air conditioning, laundry room with outdoor shower. Linens and towels are provided. Maid service can be scheduled. Large flat Screen TV’s, Wi-Fi. 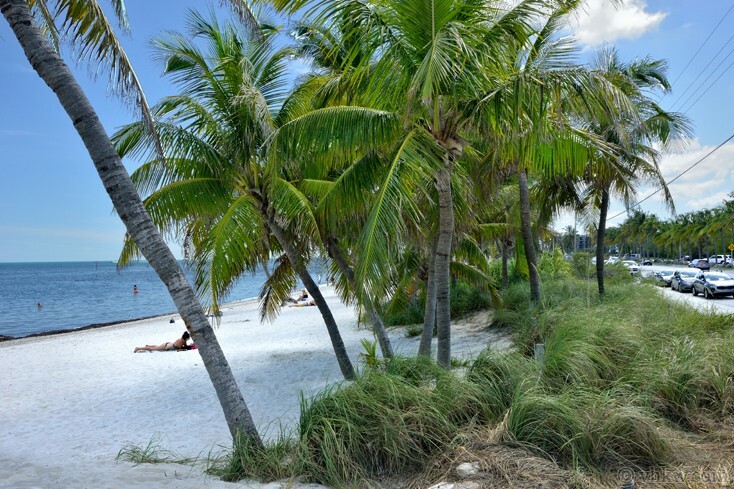 Area: Mid-town with easy access to the beach on the south shore of the island. Easy bike ride to Duval St., about a 25-minute walk to Old Town. Close to the White Street Gallery neighborhood where you find Faustos’s Fine Food Palace, shopping, galleries, and more restaurants. 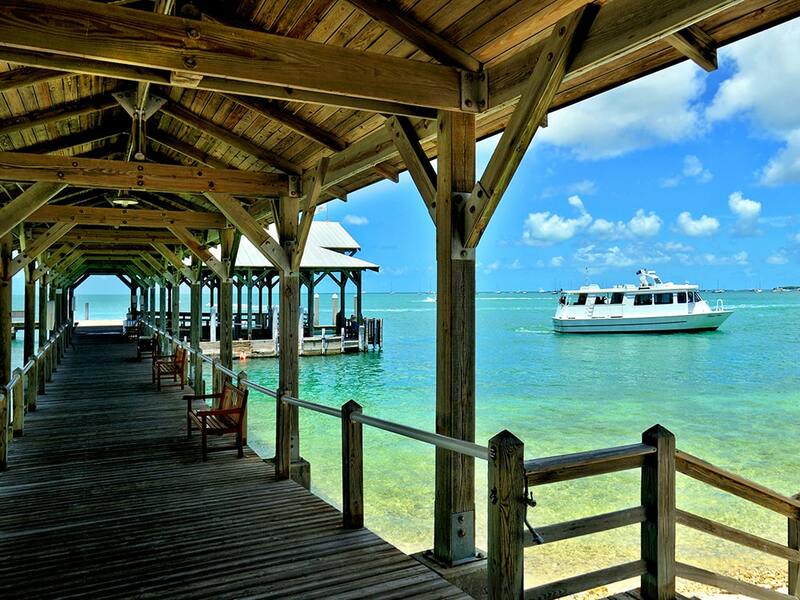 All Old Town Key West features including, museums, sailing, boating, snorkeling, diving, theatre, night life, family activities an easy bike ride away. Activities: So, what’s to do now? In this place, you’ll feel like you’re part of the local neighborhood. 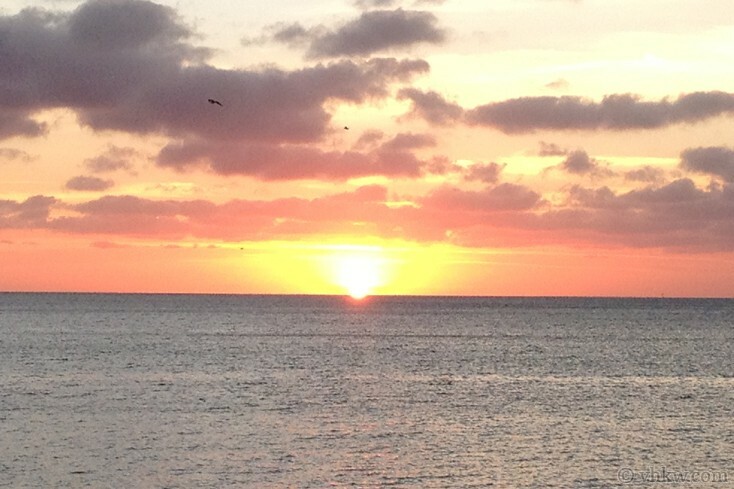 You’ll feel the light ocean breezes, and it's not unusual to see people walking or biking to the beach in bathing suits, a towel and cooler under arm. 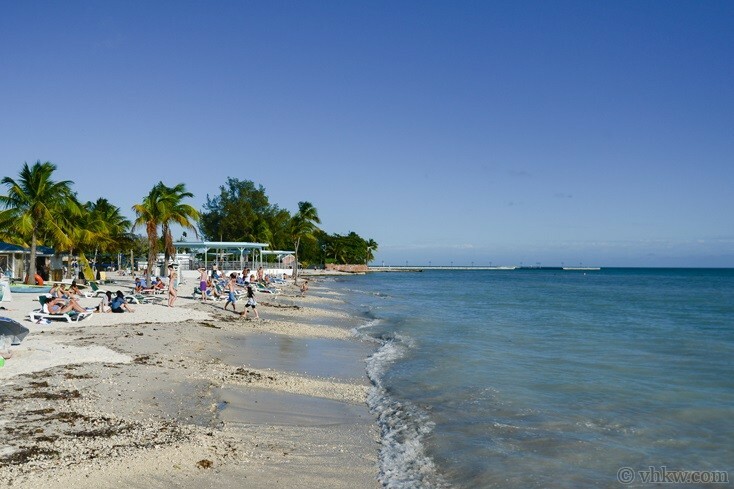 Just a few blocks away you can walk or bike to Smather’s and Higg’s Beach, and in 15 minutes you can walk to marvelous landmarks. These include the stunning Pre-Civil War Fort West Martello Towers (home of the tranquil Key West Garden Club), the never crowded White Street Pier where you can stroll several hundred yards out over the Atlantic Ocean, Salute Restaurant, Rest Beach, Bocce Ball Courts, Tennis Courts, secure and enclosed small children’s park with cabana tables. Restrictions: Smoke free house. 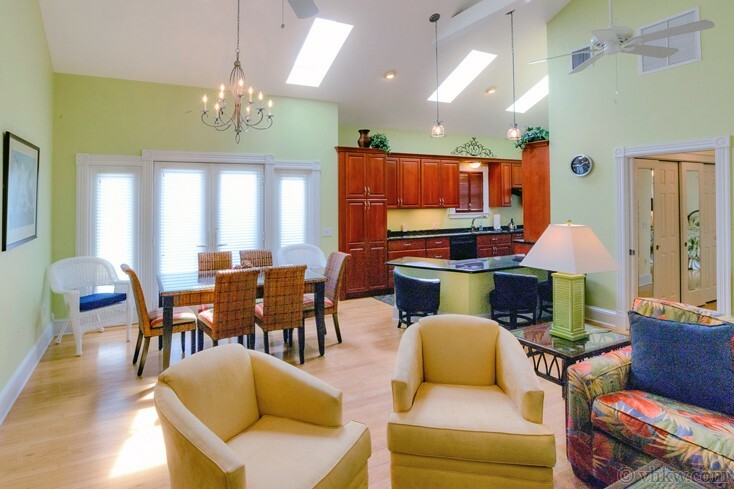 This property is ideal for professionals and families. 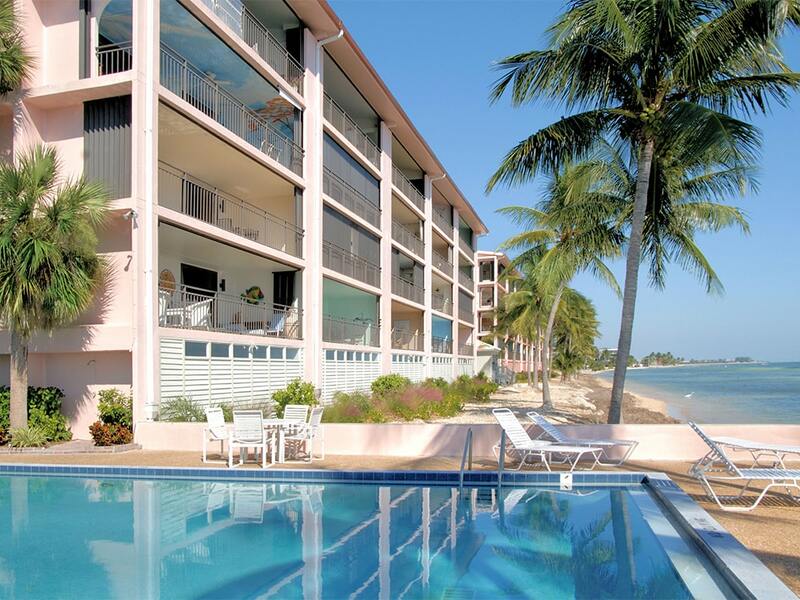 It is conveniently located to all Key West has to offer but understand that it is not suitable for loud partying. We do not accept guests less than 25 years of age unless accompanied by a family group or guardian. Pets: Pets may be possible with prior approval and additional pet fee. We enjoyed our stay at 1518 Von Phister.